Wow! It has been almost 5 months since I last posted here. I really need to learn not to neglect my blog. I had a really busy (well, busy for me) season with my etsy shop. I have quite a few ideas in the pipe and will be posting at least one new fabric combination for my anchor pillows in the next month. After that it will be new designs! I can’t wait! This holiday season I only handmade ONE gift! I cannot believe that was all I managed to get completed. Luckly I wasn’t planning on too many handmade gifts this year so I didn’t stress myself out or disappoint myself. 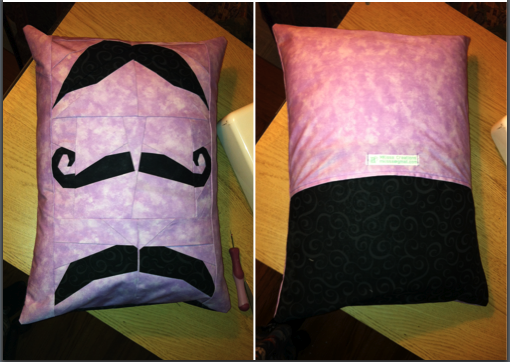 What I did manage to make though, was this awesome mustache pillow for my teenaged niece. She loved it and I had a blast making it. The three mustache patterns are included as part of the TWELVE different mustaches that Jennifer from Sewhooked created for her Mustachio pattern. Categories: Uncategorized | Tags: mustache pillow, paperpiecing | Permalink.